April 23-25 in San Francisco. 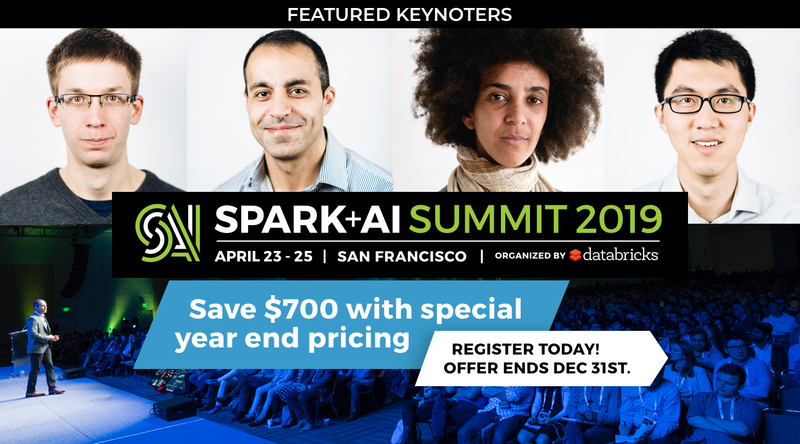 This Summit is the largest Spark + AI community gathering in the world! You will learn data science and engineering best practices for building real-world AI applications - in natural language, image and video processing, speech recognition, recommendation engines, and more. Don't miss $700 off with year-end pricing! Apache Spark™ PMC member and the top contributor to the project, will speak about latest efforts by the Spark community to unify data and ML technologies. One of the original creators of Apache Spark™, will discuss the latest innovations in MLflow, the open source project to manage your ML lifecycle. Stanford AI Lab Researcher, will discuss real-world AI challenges stemming from algorithmic bias and the ethical implications underlying every AI initiative. Learn from your peers, network with your community, and get trained by Spark & AI experts.